Read the Scope and Sequence document. Research proves that belonging to a Twelve Step Fellowship group increases the chances of long-term recovery from addictions and is helpful with treating mental health disorders. As proven through Project MATCH research, Twelve Step Facilitation (TSF), together with involvement in a Twelve Step group, helps individuals succeed as they move from treatment into recovery. TSF is listed on SAMHSA's National Registry of Evidence-based Programs and Practices (NREPP). 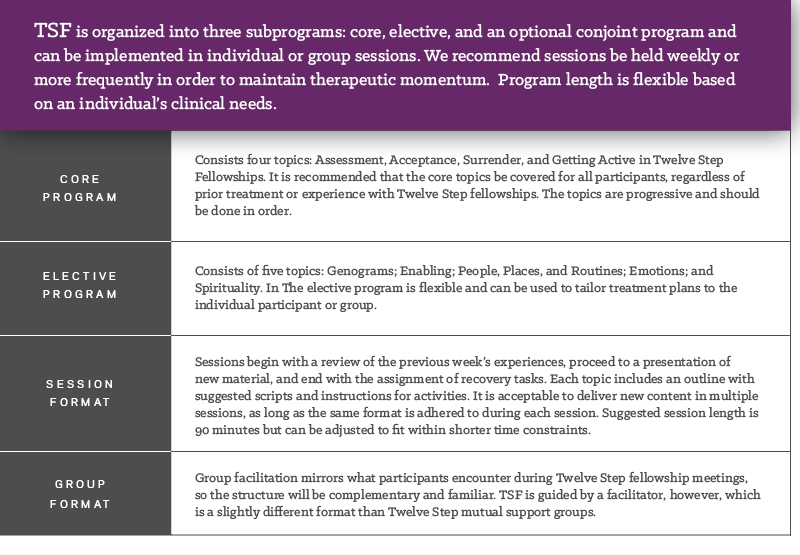 Twelve Step Facilitation is ideal for those working in community-based, corrections, private practice, and mental health settings. Click here for more information on the Twelve Step Facilitation programs and Program Implementation Training.